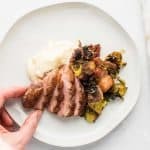 Pan-seared duck breast is so simple and easy but tastes elegant and fancy! Tender, juicy duck breast with crispy savory seared fat over bold and slightly sweet dried cherry, shallot and red wine sauce. Preheat the oven to 400°F. Let the duck breasts sit out at room temperature while the oven preheats. Dry off any moisture and score the fat side in a criss cross pattern. Season the fat generously with salt and a light sprinkle of black pepper. In a heavy bottom skillet, place the duck breasts fat side down in a cold pan. Place the pan on the burner and gradually increase the heat to medium-high until the skin is very crispy, browned and easily releases from the pan. This should take about 5 minutes of cooking. Turn the duck breasts over to sear the flesh side. Cook about 2 minutes. Turn again so the fat side is down and place in the oven. If your pan is not oven safe, transfer the duck breasts to a sheet pan that has been kept warm in the oven. Cook the duck breasts in the oven 6 to 8 minutes. For medium rare, cook for 6 minutes. For medium to medium well cook for the full 8 minutes. After cooking, remove the duck breast to a cutting board to rest. Drain the excess oil from the pan to a small bowl. Let the duck breast rest for 5 to 10 minutes then slice in 1/2 inch slices and serve immediately. After draining the excess fat (see note) from searing the duck breast, bring the skillet back to the stove top over medium-low heat. Add sliced shallots and garlic to the pan, stirring well. Once the shallots and garlic become fragrant and the pan is hot, add the red wine stirring well to scrape any bits of duck from the bottom of the pan and incorporate into the sauce. Reduce the heat to low, add the butter and dried cherries stirring well until the sauce starts to bubble and the butter in well incorporated. Spoon the sauce onto the plate and top with the freshly sliced pan-seared duck breast. If your skillet is not oven safe (the handle is made out of plastic) you can use a baking sheet to finish cooking the duck breast, but keep the sheet pan warm in the oven while searing the breast in the skillet. Excess fat can be reused to make super delicious roasted potatoes. Trust me. If using a different the same pan for the sauce, you will not need additional salt. There will be residual salt for searing the duck breast that will incorporate into the sauce. If using a new skillet for the sauce, taste the final sauce and add salt and pepper as needed.